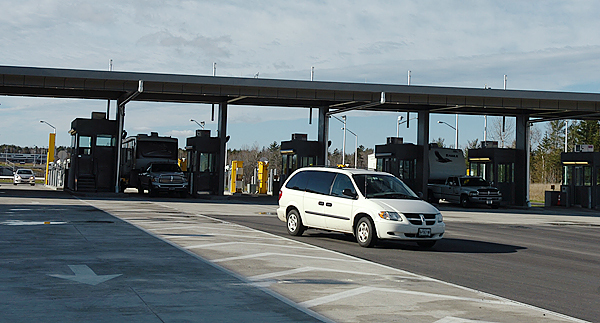 CALAIS and ST. STEPHEN, New Brunswick — The two new border ports of entry in Calais and St. Stephen, New Brunswick, opened Monday morning without a glitch. Except for one man who was waiting on the U.S. side at 4 a.m. because he wanted to be the first one across, there was little fanfare and no problems, according to officials on both sides of the border. The 53-acre, $125 million project took just more than a year and a half to complete, and has been in the planning stages for a decade. Especially for commercial vehicles, the new crossing will provide a safe, roomy checkpoint and is quite a contrast to the cramped facilities at Milltown and Ferry Point in Calais. 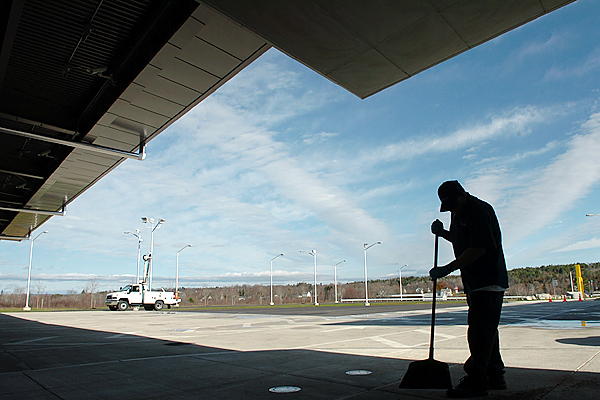 The new U.S. port stands on 53 acres, while the Ferry Point port is just more than an acre. 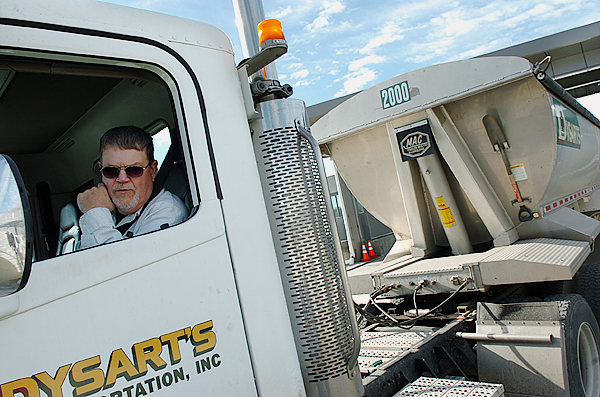 “This is so clean and so nice,” Dysart’s truck driver Kermit Badger of St. Albans said Monday, just after crossing from Canada into the United States. He was hauling road salt. The new crossing is off Route 1, just northwest of the Calais center, on the St. Croix River. The $10 million cost of the bridge project was shared equally by New Brunswick and Maine. The two facilities appear very different. On the Canadian side, the port resembles a turn-of-the-century railroad station, complete with hand-carved wooden benches with padded seats, a patterned tile floor, soft green walls and period lighting. The building has a pitched roof and stone walls, and one Canadian official thought it looked a bit like a pub. On the American side, the port is quite stark and utilitarian. The exterior is clad in steel mesh, the building is shaped like a very large box, and interior furnishings are minimal. The walls are white, and seating is restricted to a long granite bench. There is a large rock garden — literally a garden of rocks, no plants — that separates the commercial and personal vehicle sides of the port. The American side has state-of-the-art equipment including a building in which a truck’s cargo can be X-rayed and huge yellow sensors at all entries that measure radiation. It has a large indoor shooting range for customs officers to practice their skills and six commercial vehicle bays for closer inspection of the contents of crossing vehicles. The new U.S. border facility cost $40 million, and road improvements in the nearby Calais Industrial Park and along Route 1 in Calais totaled another $11 million. 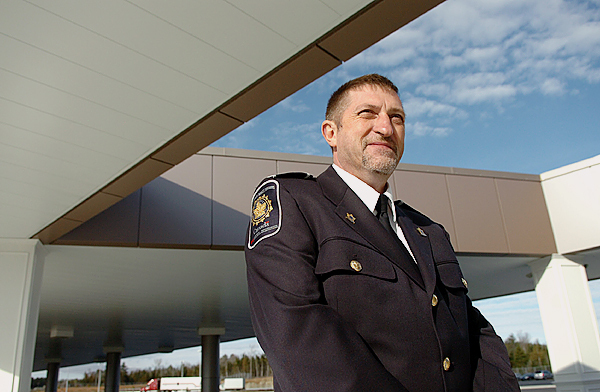 A half-mile away, standing outside the Canadian port of entry, Farquharson’s counterpart, District Director Don Collins, agreed. “This is very exciting,” he said. 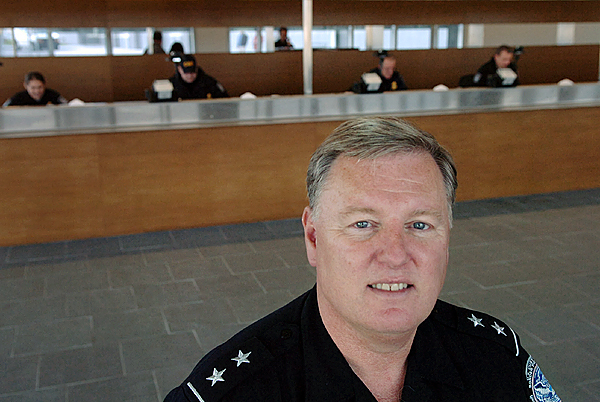 The two entry ports are state-of-the-art, high-security facilities. But Monday was a slow traffic day and a time to make sure all systems were working. 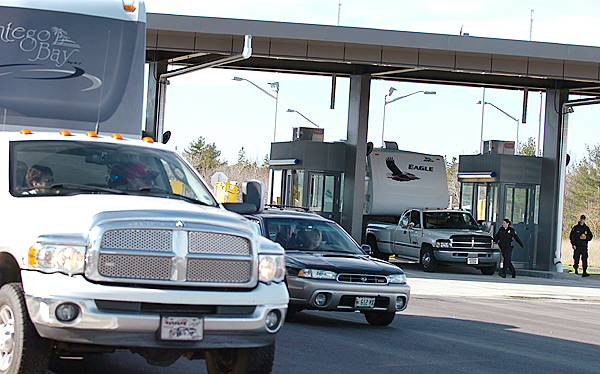 At one point, it took 20 cars just four minutes to cross the border from the United States into Canada. Workers were putting the finishing touches on the ports in both countries. Signs, lighting and some outbuildings, including the Canadian duty-free shop, remained under construction. Collins said 57 people work at the Canadian port, and it was estimated that a similar number work on the American side, although Farquharson would not provide exact employee numbers for security reasons. Calais Police Chief David Randall said traffic in and out of the border, through a roundabout on Route 1, was flowing smoothly. “There were 10 cars lined up there at 9 this morning, all waiting for it to open,” he said. Farquharson said Milltown and Ferry Point crossings would remain open for passenger vehicles. Joe and Gayle Lindsay of St. Stephen were using the new crossing to return to Canada after purchasing a new truck in the United States.